Nick Chubb rose from being the fourth-string tailback at the start of the season to being a 1,547-yard rusher and eight-game starter as a freshman last season. CHUBBTOWN — There’s not a lot here nowadays. 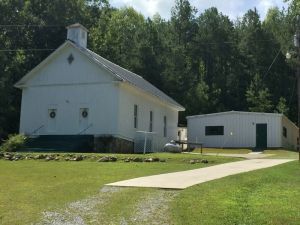 The only buildings still standing on the site of this once-vibrant town named for the founding family are Chubb Chapel United Methodist Church and the rock building that housed the volunteer fire department. There’s also a cemetery. The rest of it washed away in the great flood of Big Cedar Creek in 1916. 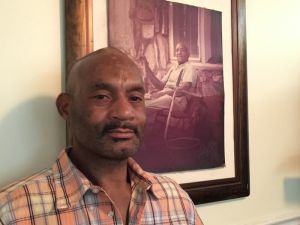 But evidence of the strength, tenacity and self-sufficiency that this community represented at the turn of the last century remains in the tangible form of its people — and one Georgia football player in particular. Nick Chubb, as the Bulldogs know their beloved tailback, is known as Nicholas within his family. That’s the given name bestowed upon him from one of the eight original Chubb brothers who settled this area in the 1850s or ’60s, depending on which account one believes. 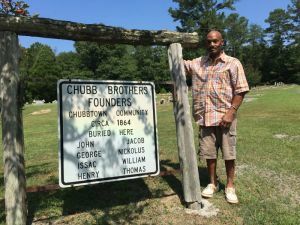 What’s certain, and verifiable in historical documents, is that John Henry Chubb founded this community along with his wife, eight sons, a daughter and a small colony of free blacks sometime around the Civil War. They came from North Carolina, near the Virginia border, and put down roots on a hillside above a creek in what then was and still is the middle of nowhere. Most of the direct descendants of the family are named for one of those eight brothers: William, Henry, John, Thomas, Jacob, Isaac, George and, of course, Nicholas. The “King Chubbs,” the family calls them. 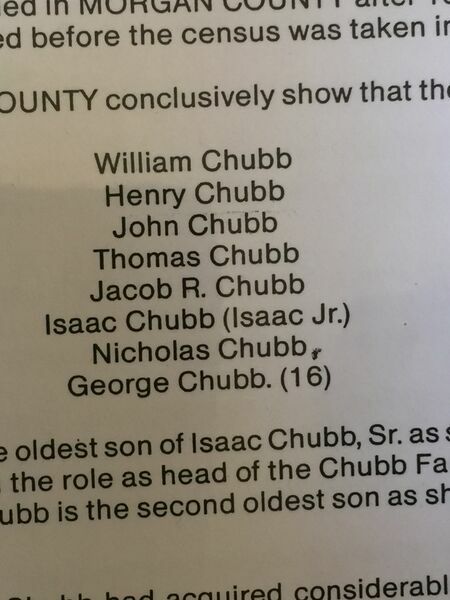 Chubb’s father is one of many in the family named Henry, including Nick’s oldest brother. How this group of people not only subsisted but flourished in the post-Civil War South remains the stuff of legend. Based on census records, Henry Chubb is believed to have settled the area sometime between 1850 and 1864. 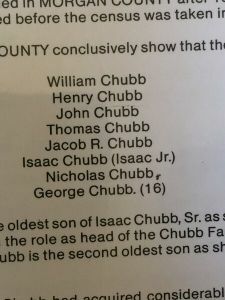 The Chubb name does not appear on the 1860 census, but records show that Henry Chub — then spelled with one “b” — purchased 120 acres in Floyd County for $900 in 1864, before the end of the Civil War. The normally quiet-spoken Nick Chubb lights up when the subject is broached. Chubb’s father, Henry, fills in some of the blanks on a late-summer tour of the area, located three miles from the Alabama border and just up the road from Cave Spring, where Nick was born. In its heyday, Chubbtown consisted of a church, a post office, a school, a saw mill, a casket company, a cotton gin, a cemetery, a grist mill, a syrup mill, a wagon company, a blacksmith shop, a lodge and a meeting hall. Henry pulls out a copy of an old map from a photo album that shows exactly where each business was located. Nobody bothered them because they didn’t need anything, he said. If they needed it, they made it. If you really want to know what Nick Chubb is all about, it’s here you come to find out. The family still owns more than 100 acres in this area, and it is here where Chubb seeks his respite from the growing fame football has brought him. He has been roaming these grounds since he was old enough to walk. Nick’s parents divorced when he was 4 and his primary residence was 10 miles away with his mother, Lavelle, in Cedartown. But Henry had joint custody of his children, Henry Jr., Zachary, Nick and Neidra, and they’d almost always end up in Chubbtown when they stayed with Dad. Henry Chubb said his youngest son learned how to swim when he tossed him into Big Cedar Creek, just like his brothers. Chubb Chapel is still an active church, 45 members strong, and Chubb served as an altar boy on Sundays. That’s what he was known for as a youth, the cute kid who lit the candles. Nick Chubb is now a household name in the state of Georgia and recognizable coast-to-coast. That tends to happen when you rush for 1,547 yards and score 16 touchdowns as Chubb did as an SEC freshman. That most of it came after Chubb was thrown into action midseason after Georgia’s Heisman Trophy candidate, Todd Gurley, was suspended four games because of NCAA rules violations, just adds to the lore. Henry’s “baby” came through just fine. He gained 174 yards on 42 touches — including 38 rushes — as the Bulldogs bulldozed the eventual SEC East champions 34-0 in Columbia. Chubb would not fail to gain 100 yards in a game the rest of the season, a period of eight games. Chubb credits his success to the same thing that got Chubbtown built — hard work. Long before he ripped through defenses like paper mache, Chubb carved out a reputation for being a workout warrior. Even before he had access to high-tech weightlifting equipment, his mother tells of him finding discarded truck tires and running sprints with them tied around his waist with a rope. He famously spent his first spring break at Georgia back home in Cedartown lifting weights and training with his former high school teammates. A Vine video of him power-cleaning nearly 400 pounds went viral this summer. Chubb’s football skills come to him naturally. His father played college ball at Valdosta State, where he was teammates with Jessie Tuggle. Henry Jr., played at Troy, and older brother Zachary played at the Air Force Academy until recently. All of them were defensive backs. Nick Chubb has been a running back since youth league. And always a good one. He rushed for 5,411 yards and scored 79 touchdowns his final two seasons at Cedartown High. Based on his career track, there could be some very big things out there in Chubb’s future. A year after succeeding a Heisman Trophy candidate, his name is included among every preseason watch list for 2015. Barring injury, a pro career at this point seems almost a certainty. Should NFL riches come his way, Chubb has some thoughts on how to invest it. It certainly has been done before.